The Mobile Marine Lab visited our school today as a complement our habitat unit. 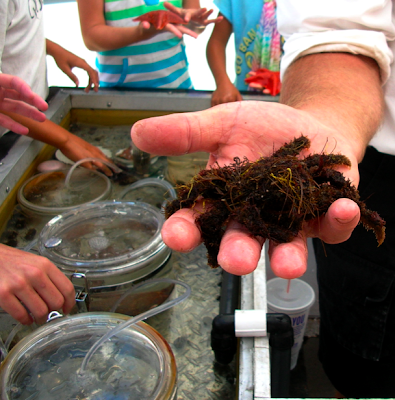 What did you learn at the Mobile Marine Lab? I thought the Marine Lab was so much fun! It was a great way to learn about the ocean without leaping into the water. It was fun to learn about the ocean this way. However, it was quite hot today and I would have liked a little dip in the Pacific! The animal I thought was most interesting was the decorator crab because if its behavioral adaptation. It collects plants and animals and "decorates" itself so it is camouflaged. Excellent adaptation! Which animal did you like? I learned to not judge an animal by its look. Most animals looked gross, but I interacted with them and got rid of my fear. What was your favorite animal? I would like to know! First, you need to tell us...what was your favorite animal and why? The Marine Lab was so much fun! I loved the little crabs squirming on the shiney shells. I also loved the pink starfish! Did you know that starfish can be pink? The coolest thing was that starfish covered with white spots, I can not believe that those spots were its teeth! What was your favorite part? My favorite animal was the bat starfish. It was my favorite because I loved how they curved around your hand when you held them. thank you for commenting on my writing and I like your Blog and other things too, keep up the good work! James and I both held star fish (I don't remember what kind) that seemed to like us. 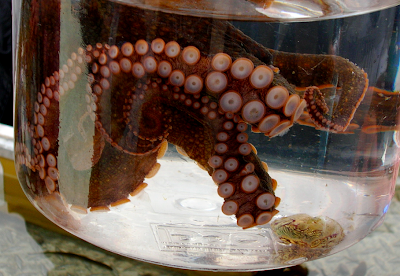 They clung to us so hard, that it was hard to pull them off of our hands and back into the water! I like it when people bring animals for us to look at. It was so fun to touch the ocean animals! My favorite was the starfish. When I put it on my arm it "hugged" me! I loved the Marine Lab! It was so cool feeling that sea slug! It felt like a really slimy piece of slim that is really wet. What did it feel like to you? I loved that we got to hold and examine sea creatures from the sea without taking a trip. 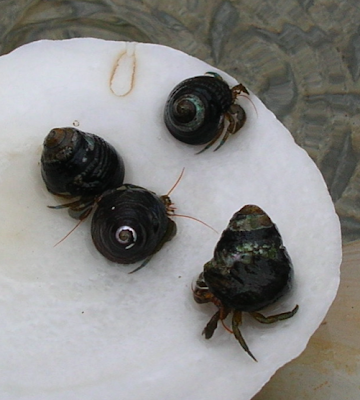 My favorite was the hermit crabs because when you pick them up they come out cautiously then crawl on your palm. You had quite an experience with the hands-on Marine Lab. It's nice that you can see this at your school. 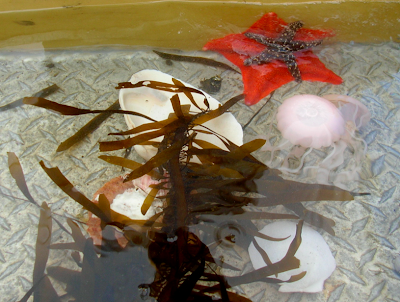 I have visited tide pools but had no instructor to describe the creatures I saw. I hope you have more visits like this. I learned many new things about marine animal life. I didn't know that octopus ink when they are scared. I had a lot of fun! I loved learning about the astonishing ocean life! 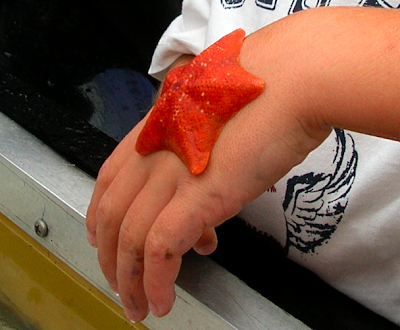 I especially liked when the star fish wrapped around my hand when I held it. The part that was the most fun was when we HELD and observed the animals all together as a class! It was very fun to touch and see sea animals. My favorit animal was the baby Octopus. The suction cups looked strange and slimy. Most of the sea animals look and feel different. For example, the decorated crab looked very strange with all the sea weed on it. The Hermit crab was very fun to play with, because everytime you put it on an abalone shell it would jump right off into the water. The sea animals are sure interesting! I found the sea creatures from the mobile marine lab very intriguing. 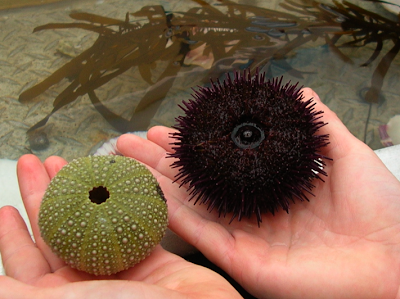 I got to feed the Purple Sea Urchin which was so exciting. 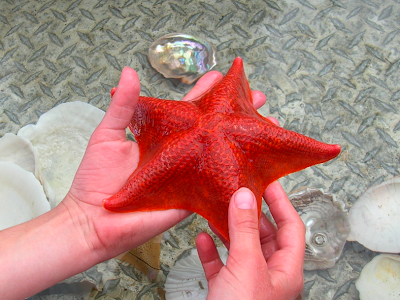 My favorite was the Red Bat Star Fish.I loved the way it gently suctioned my hand. When I put it back in the water, it was really hard to pick back up because it was suctioning the tank. :) I thought it was interesting to learn that the Octopus has false eyes to trick it's predators! I enjoyed learning about these sea creatures so much that I hope to learn more about our under water friends in the future. I was dumbstruck when I read that KELP is used to make ICE CREAM! Well you know what they say, everyone learns something new everyday. Cool animals. I liked the octopus. It was cool the way it stuck to the glass!!!!!!!! Wow! that is so cool keep up the wonderful work I think all of you are awesome!!!!!!!!!!!!!!!!!!! and I am from Mr.Salsich's class,my name is Iylee.